Q: Congratulations Nico, a fantastic win. Nico ROSBERG: It's been an awesome weekend for sure, the whole weekend had gone great from the word go, so it's been very, very special, especially on this legendary track, beautiful to win here. And of course congrats to everybody, to all my colleagues in the team, for clinching a third Constructors' World title. So absolutely deserved, definitely it's been an unbelievable effort all these years, so let's celebrate hard. And thank you very much to all of you, a very, very special weekend this weekend, you put on such a great show out in the grandstands, it's amazing. Arigato. Q: Turning over, Nico, to the important things. How important is it today not to have Daniel Ricciardo up here to have a shoey again, to drink out of his show? Rosberg: I'm going to make sure that he never wins again this year because I don't want to drink any more out if his shoe. Q: That's a good one. So, going from Germany over the Dutch border to Max Verstappen. Congratulations, man of the race, fantastic. You had the hot breeze of Lewis on your neck, maybe you two had more traffic on track than on the Dutch motorway? 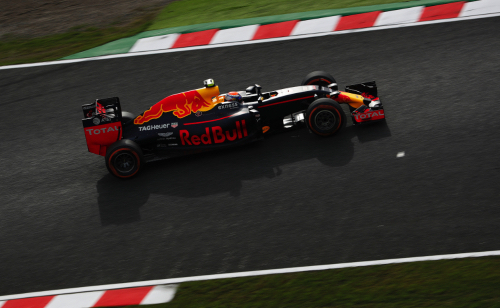 Max VERSTAPPEN: Yeah, there was a lot of traffic but we saved the tyres a bit in the last stint. I think in general we had a great strategy. Just to race against the Mercedes cars, I think that's always positive. To come home in second, a big thanks to the team for that. Q: How hot was the breath of Lewis on your neck at the end? Verstappen: It was not as hot as in Malaysia. The temperature here helped, but of course Lewis was pushing hard and we had a little moment in the chicane, but of course very happy to stay in second. Q: Coming to you Lewis, not an easy day for you. The start: what happened there, was it just due to the slippery surface? Lewis HAMILTON: Well, firstly, a big thank you to everyone that came out today. A big congratulations to this team. I'm very, very proud to be a part of it. I'm glad I got some points for the team today. Congratulations to everyone back at the factory at Brixworth and the whole of Mercedes. We couldn't have done it without all the support we've had. I did the best I could from where I was in the race but I'm happy with getting the points. Q: Now Lewis, the next races, the world championship, Nico leading now - now will we see the best Lewis Hamilton to fight for the championship? Hamilton: Of course. I'll give it everything I've got, as I did in the race and we'll see what happens. Q: Thank you so much, Lewis. Coming back to you Nico, I know tonight you're flying home but will you rock the plane again or do some karaoke in between in the land of karaoke? Rosberg: Maybe a little bit, but not too much. The season is still long, many races to go around the world, so I need to keep my energies. Q: Lewis, let's pick it up with you first. At the start obviously you lost ground. What part did the dampness on that side of the race track play, do you think, in your getaway? Perhaps a little detail about your fight back and then the championship position as it stands, trailing Nico by 33 points with four races to go. Hamilton: Firstly, big congratulations to the team, incredible success for the last three years, very proud to be a part of it and to help contribute to it - so a big thank you to everyone for all of their hard work. This is a great result. Yeah, I don't think the damp patch had really anything to do with it. I just had... I made a mistake and then just working my way up from there was tricky but, y'know, I did the best I could. Q: And the 33 points, four races to go, feelings on that. Hamilton: That's a healthy margin for Nico, he did a great job, so congrats to him. Q: Let's return to our race winner, Nico Rosberg, ninth win of this 2016 season, 23rd of your career and your first, as we were hearing on the podium, here in Japan after three pole positions. Clearly the start was decisive today. Your thoughts on that and how your race rolled out. And then, also your thoughts on having that margin. 33 points with four races to go. Niki Lauda has just said on TV it's a "comfortable" position. Your thoughts. Rosberg: Yeah, for sure. Just the whole weekend went really well from the word go. Just felt good in the car, found the right balance and all the way through to qualifying. Got that lap done and then the start went well... just everything went well. Just controlling the pace and the gap to Max in the race. Perfect weekend really. Really happy with that. To win on this legendary track as well. Points, yeah, I'm well aware of the 33 points of course but it's not something I'm focussed on, as you know. Just want to take it race by race. That's what I did this weekend. So focussed on trying to win the race and very happy it worked out. Still many races to go, so just keeping my head down. Q: Coming to you Max, your sixth podium in Formula One. One of the best I'm sure, great measured drive - but tell us more about the move to block Lewis at the end. Before his actual move was there a little bit of memories of holding off Raikk‚nen in Spain earlier this season, and then when he actually made the move, was it going through your mind that he had more to lose than you did? Verstappen: To be honest, I never really thought about it, both of those things. I was just doing my race. I think the car was feeling quite good. I was trying to follow Nico a bit and I think in general we did a great strategy, so the car was working well and, of course, Lewis was closing up a lot. At the end of the race he was pushing really hard and I knew he's fighting for the World Championship, so you're not going to do crazy things, of course. But I think in the end it was all good. I managed to keep my tyres alive and to come home in second. That's of course a great result for myself and I think also one of my best races so far but also for the team I think. For the Constructors' it's a very good result. Q: Lewis, your 100th podium in Formula One today. If you could just tell us a little bit about, particularly when you went onto the hard tyre you were extremely fast straight away, I think you passed four cars in one lap at that phase of the grand prix, so maybe a word about that. And then about the move at the end. You came over the radio and said Max moved under braking, as if to suggest you weren't particularly happy about that. Maybe you could clarify what you were saying. Hamilton: Yeah, the middle stint, the car felt good. Generally the car felt great throughout the race, so it wasn't really a problem and I'm not really quite sure if I was overtaking backmarkers or not but I was just overtaking whoever I could. Had a good run there. Fought hard at the end but just didn't make it. Q: But you were happy with his move to defend? Hamilton: Well... it doesn't really matter now. It's done and we move forwards. Q: (Rodrigo Franca - VIP Magazine) Nico, of course there are four races to go, you said you are thinking race by race but you have two match points as we might say in tennis because you have more than one victory advantage. Do you have a different approach to the next races or are you just doing race to race? Rosberg: There's still a long way to go, hunh? There's no point in changing my approach now so I'm sticking with what I'm doing because it's working well. Q: (Michael Schmidt - Auto, Motor und Sport) Lewis, after the first lap where did you think you were going to end up, being in P8, I think? Hamilton: Honestly I don't really remember. I can't remember, I was just far back and I was just looking to go forwards. Q: (Lennart Wermke - Bild) Lewis, you said you made a mistake at the start. Can you give us a little more detail, what exactly happened there? Hamilton: Not really, I just got wheelspin. Q: (Rodrigo Franca - VIP Magazine) Max, when you were fighting with Lewis, did you imagine that he would attack in the chicane? Is that why you made a move to defend, you were expecting him to go there? Verstappen: Yeah, it was just for fun! No, of course you see him coming in the mirrors so... Already the laps before he was closing quite a bit but I saw already out of T14 that he had a good exit so yeah, I was using a bit of energy and I defended into the last chicane. All good.